Editor's note: This article is the second in a three part series excerpted from Yamaguschi's classic karate text, "Goju Ryu Karate Do Kyohan: The History and Fundamentals of Goju-Ryu Karate," now in reprint. The first article was "The History and Fundamentals of Goju-Ryu Karate," and the third article is "Practice Fighting." Today, karate-do has become widespread not only in Japan but also all over the world and competitions are held in many places. Most of them are title matches by a game of kumite. For that reason, the purpose of practice is to win the competition; therefore, most of the players emphasize practicing kumite. They do not practice kata as much as is needed. I think this is because karate has spread internationally by turning to competition, like other sports, instead of the unification of each karate ryu-ha. I feel that this is very unfortunate. Kata is the attitude of self-defense that you perform with a presumed attack in mind as well as your defense on a fixed embu-line (the line of movement of the kata), to protect yourself from a hypothetical enemy with your body that is trained well by strict practice. Which means you structure the attack from the hypothetical enemy with a meaningful and effective counterattack systematically. You perform individually with the interpretation based defense and on that theory. Moreover, the purpose of Goju-ryu kata is not only the practice of techniques but also the training of the body (or gathering your internal thoughts), as a result, you can say that kata is the "expression of yourself when you learn karate-do." When karate-do was called te (meaning "hand") in Okinawa, there was neither an organization nor a ryu-ha (an organized style passed down over time) at that time. The practice of te had been accomplished secretly in Naha and Shuri (districts which divide Okinawa in two). The practice was very strict. It was not like the practice you do in a team at the dojo, which most people do now. The practice was done headed by a teacher with a few students, or one-on-one training. The place was sometimes in a room floored with tatami mats (traditional rectangular Japanese straw floor mats), sometimes in a field or on the beach. Training was always done in a natural environment while hiding from others and in secret. For that reason, there were no textbooks to hand down dealing with kata. It was instructed by the ancients, body to body so that the origins of many kata are unknown. Currently, there are 60 types of kata from Naha and Shuri; however, because the origins of Naha-te and Shuri-te are different, the names and the way they are done show a big difference. The person who systematically structured kata for Naha-te is Higaonna Kanryo Shihan (master teacher), who was the shihan of Mr. Miyagi Chojun. For Shuri-te, it was Matsumura Soshu Shihan. As I explained in, "The History of Karate-do," Higaonna Kanryo Shihan went to Fukuken-sho in China and learned Chinese kempo. He put Naha-te and Chinese kempo together and created the basic form of Sanchin and Tensho. 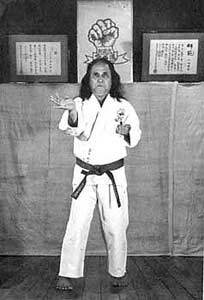 Ikibuki was invented by Miyagi Chojun Shihan, who inherited the style from Higaonna Kanryo Shihan. When the breathing method was taken into kata, the kata were improved. After that, the kata Gekisai numbers 1 and 2 were created to spread the kata of Goju-ryu. Chinese names are used for Goju-ryu kata because both Higaonna and Miyagi Chojun Shihan learned Chinese kempo in China. Presently, the names of kata are written in katakana (one of three Japanese syllabaries), however, in this book, Sanchin and Tensho are written in kanji (characters). There is no end to the practice of kata. Even though a person who has a high dan performs, the acts are never perfect. The practice is unlimited because kata is for improving yourself mentally and physically. Yet the performance has to be improved in different ways with each step as a beginner, whether you have kyu [colored belt level] or dan (black belt level), although you are performing the same kata. Knowing a difficult kata does not mean you have a high dan. In some foreign countries, sometimes they evaluate a person by the number of kata they know. I believe that it is not the number of kata you know, but the substance of the kata you have acquired. When you perform kata without an opponent, you feel like there is no meaning in the technique so that the fist of seiken-tsuki (basic straight punch) or the tightness of the standing position can be loosened. You should not think that you are doing the attack or the defense by yourself; you always have to think that you are defending against an attacker. Usually you do kata by the gorei [commands] of a person who has a higher kyu or dan than you. There are two ways to gorei: One is to gorei in the beginning and the end. The other is to gorei each technique, by numbers. Especially, the latter is used for practice of Fukyu-gata (it will be explained later). It is used when you practice with many people, such as beginners. However, in principle, the practices of techniques are done without gorei. All the practice of kata is done by starting the gorei of "rei" (bow), "mokuso" (close your eyes to clear your mind), the name of the kata, "yoi," (prepare commend) and "hajime" (begin the kata) by a leader. If there is no leader, you try to gorei in your mind by yourself. Stand in musubi-dachi (heels together, open toe stance) and put your hands down with the fingers straight. The thumbs have to be bent from the second joints inside. This is the posture of kiotsuke (attention). You have to release the power of the body. You bend the upper part of the body by the gorei (command) of "rei" (bow) by a leader. The eyes have to be staring at the floor two meters in front of you . When the leader calls "yoi," (prepare) you have to cross both hands in front of your body while you breathe in; and then, while you are breathing out, bring both fists to your sides as if you are tightening your belt, then tighten both armpits like you are pushing at the floor with your fists and put power in your whole body. You open both heels to the outside and when you breath out, bring them to heiko-dachi (parallel stance). This posture has another name, jinno-dachi. It is the posture before you get in ready posture (kamae). All the muscles of your body have to be tensed. The placement of your eyes is a little bit higher than the height of the eyes. The reason you cross both hands in front of your body is to cover the groin area from a sudden attack; at the same time, you show the opponent that you will not attack suddenly. As in the etiquette of the samurai in which they take off a katana (sword) from the waist and change it to the right hand showing that no cowardly act, such as slashing the opponent without notice, will occur. From that meaning, the inside of the hand that is crossed has to be your dominant arm. Do not put the power on the shoulders. Pull in your chin and put power in the abdominal muscles; however, do not be stooped. Straighten your back but do not stick out the abdomen. This excerpt from Yamaguchi's book, "Goju Ryu Karate Do Kyohan," was submitted by Masters Publications. This is the fourth book in the Limited Edition series translated from Japanese into English and published by Masters Publication; the first was "To-Te Jitsu" by Funakoshi Gichin, followed by "Okinawan Kempo" by Motobu Choki and "Wado Ryu Karate" by Otsuka Hiroki.